IPHLPSVC Tuning: IP Helper is actually used to enhance the connectivity features of your Windows Computer. In fact, every personal computer that runs windows operating system from Windows starting version to Windows 10 uses the IP Helper to get the best connectivity features to work. Totally, IP Helper IPHLPSVC is the major reason for all the connectivity features of your personal computer. IP Helper IPHLPSVC Services Tuning is not very much known to people except the Tech Geeks. I was a nerd looking for the IP Helper IPHLPSVC Tuning a month ago and finally came to know that it’s the most important thing to carryout correctly. Let me tell you why? IPHLPSVC is the only major component which enables the tunnel connection to the Windows operating system. 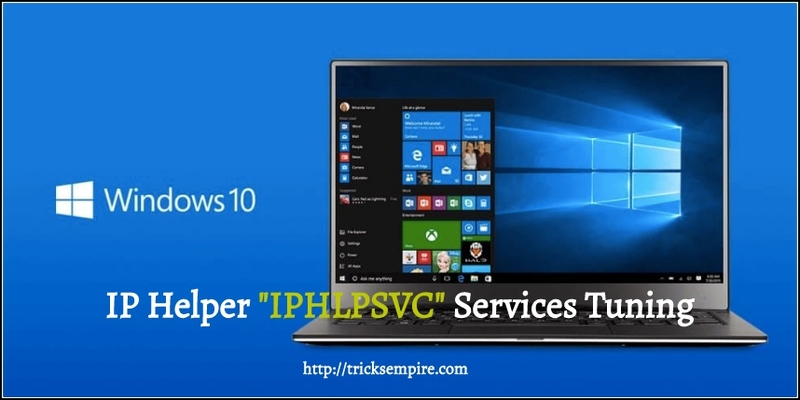 Actually, the tunnel connection to the Windows from IP Helper “IPHLPSVC” is provided with the help of IPv6 Transition technologies. You will better understand this concept you have already came across modifications to the IPv4 and IPv6. That usually comes when you try to change the system IP Address and Port details such as, :8080 or :0000, etc. If you are looking for the IP Helper IPHLPSVC Services Tuning, you are going to have a great time with your PC and I am pretty sure about it. Because, it will make your system more efficient, user-friendly and runs without any issues. Whenever you try to change the IP Address of your Windows computer, then the IP Helper will assist you in a right way. We have got a wonderful and easiest way to iphlpsvc tuning on Windows. Check out the following methods provided below and increase the potential of your personal computer. Don’t need to download any setup file and you don’t to buy service from Fiverr or any similar sites. All you need is a proper method to do that; we are here with that. 1. Tap the “Windows” or “Start” button on your personal computer. 2. Type “Services.msc” and hit enter in the search bar that appears on the screen. Now you can go to the IP Helper and configure things easily. 3. Tap “IP Helper” option which will play a major role in connectivity issues of any Windows computer. Choose “Automatic” option; that will actually set things in a manner to automatically configure settings whenever needed. 4. Now, you need to click “Ok” to allow modifications you did so far. As you have changed the option to “Automatic”, it will get all the right features to deal with the IP Helper Options Online. Please follow this guide to make things simple and risk free. Tune up the IPHLPSVC using the Services.msc by following the guidelines on this page. If you have any issues, please leave them in the comments below. Hey Meran, Which account you want?